Text message marketing offers businesses a direct line of contact to their customers. This can be extremely valuable, but only if you create strategic campaigns to avoid user burn out. When a marketing tool provides small businesses with a direct link to their customer, it can often be abused. What was once successful is now despised by your recipients. It’s only natural that small businesses will abuse text messaging. If not now, then at some point. Marketers tend to ruin things, and then we move onto the next trend. Don’t believe me? When was the last time that you were excited about an email from a business? 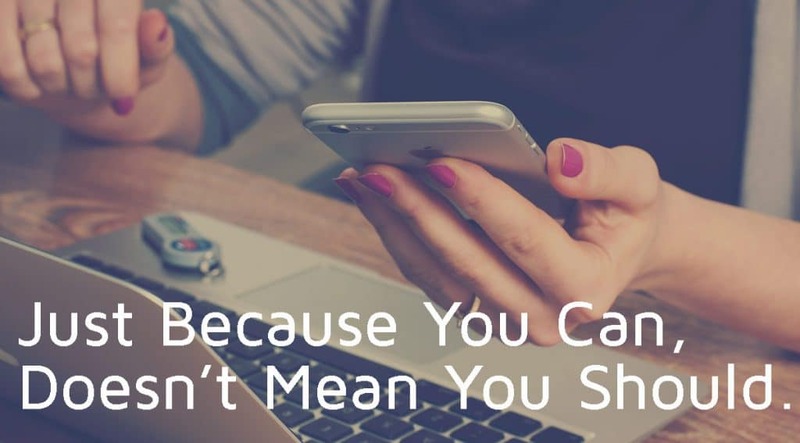 That doesn’t mean that text message marketing is or isn’t right for your business. If you are curious, here are a few reasons why you might want to avoid it or delay implementing it for now. It’s possible that you need to pump the brakes on moving forward with text message marketing. If these sound familiar, then you should most likely refocus your attention elsewhere first. Your website still isn’t mobile friendly. Find out if yours is mobile friendly here. Search engine optimization is still on your to-do list. Content marketing is something that you just don’t understand yet. Learn Content Marketing 101. Social media strategy? You thought you just needed to update customers with sales or open dates. Tracking website traffic isn’t a priority to you. Understanding where and how your customers find you is something you’re unsure of. Did your texting list opt-in, or do you plan on surprising them? Read a few of the texting laws here. You should have a plan for your messages; the content, scheduling, when to send spontaneously. If you can’t provide value in your message, don’t send it. If you plan on using a cell phone to send your messages. It costs about the same for a messaging service and you have significantly more marketing tools at your finger tips. When consistency is something you struggle with, it’s best if you don’t start. If you made it through the list without wondering whether you need to take a step back, then you’re probably a good fit for text message marketing. It’s a great way to supplement your overall digital marketing strategy. If you feel like maybe you need to take a step back, contact TrustWorkz for a FREE web presence analysis. Please recommend and share this content with your networks.